It can be annoying if you are a frequent user of the number pad keys when you log into your PC as by default, NUM lock is turned off on the logon screen. This is even more annoying now that Windows 10 is promoting logging in with a PIN when everyone goes through the initial setup. The easiest way to enable number lock on the Windows 10 lock screen is to download and import this registry key by double clicking it after download. 1. Click on the Start Button and type in regedit and hit Enter. 2. Navigate through HKEY_USERS, .DEFAULT, Control Panel and then Keyboard. 3. 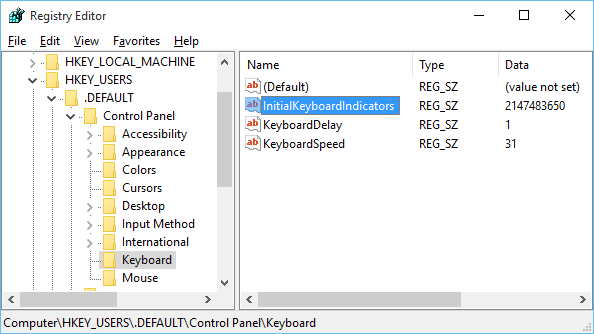 Right click on InitialKeyboardIndicators and select Modify. 4. Set the value to 2147483650 and click OK. Alternatively, some user have had success with just setting the value to 2. 5. Reboot and number lock should now be enabled. There appears to be a bug with the boot process properly reading this setting when the fast startup feature of Windows 10 is enabled. Fast startup is a useful feature that shaves a few seconds off your boot time by hibernating a portion of the boot process. As this hibernation image was created prior to the InitialKeyboardIndicators setting change, that may explain why the updated value is not properly loaded. You can turn off fast startup in Power Options and turn it back on later very easily. 1. Click on the Start Button and type in Power Options. 2. Select Choose what the power buttons do. 3. Hit Change settings that are currently unavailable. 4. Under Shutdown settings, remove the check next to Turn on fast startup and then hit the Save changes button.